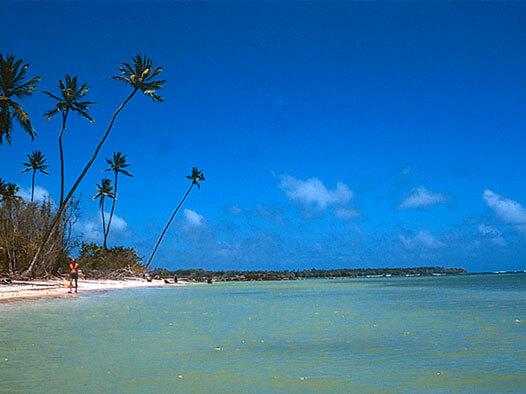 Tobago's premier tourist beach with its white sand, coconut palms, shallow turquoise sea and a pretty jetty. The price to get in is $2US but the bar is cheap, as is the food. There is lots of choices for lunch here, you can buy everything from local food to pizza and chips and they have delicious juices and smoothies. There are lots of high-quality craft stalls abound where you can buy everything from clothes to cds and there are plenty of souvenirs. Recliners are available for only 10tt and there are palm-covered huts with seats and tables for shade. This is a great beach for small children to bath as the water is calm and stays shallow for a long way out. This beach is very popular for jet skiing and windsurfing as there are good winds on the far right of the beach from December through to June. Glass bottomed boat trips to Buccoo Reef and Nylon Pools leave from here. Whilst close to the airport, it is reached by a long, narrow, shady road running along the sea. This whole area in Crown Point is usually busy with lots of bars and restaurants to check out.